Cook water, sugar and glucose to a syrup. 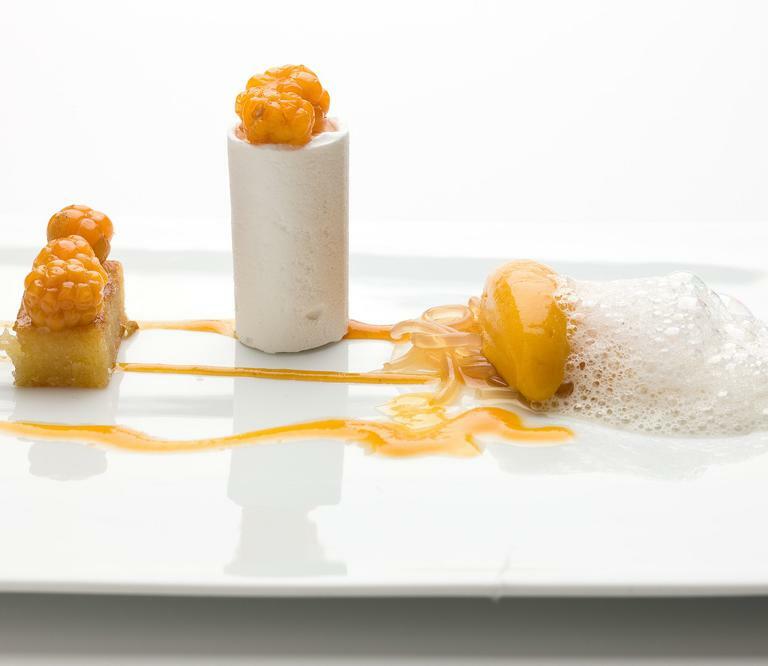 Mix with cloudberries and prepare in ice-cream machine. Juice in bain-marie for 1,5 hours. Sieve. Dissolve soaked gelatin with juice and cool. Cook spices in sugar syrup and marinate cloudberries in that overnight. Warm cloudberries, sugar and soaked gelatin. Cool. Mix with yoghurt and finally whipped cream. Prepare meringue and dry in 70 degrees oven. Whip sugar and butter to a foam. Mix in sifted almond powder and flours. In the end eggs one by one. Bake in 180 degrees oven about 20 min.